"Horror is a genre founded on emotion. There's many such genres. Romance is a genre founded completely on emotion. Comedy is a genre completely founded on an emotional state. Horror is in that same nebulous realm. To me, the keystones are not the artifacts and the archetypes that people tend to associate with horror, but the unconscious well springs that are touched by horror. There are the obvious negative ones: fear, dread, the feeling of being profoundly disturbed, frightened. But I think there's also an expansive and very positive side to horror, which is usually ignored. There's a very real feeling of awe and wonder that is tapped in some of the best exercises in horror..."
At the height of the cold war, we lived with an all-too-real-fear; nuclear war. The supernatural tales of vampires, werewolves, and ghosts seemed like childish fairy tales. You could wake up tomorrow to the end of the world. 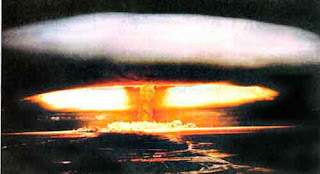 The words 'nuclear' and 'atomic' became our bogeymen. It's no coincidence that horror went underground at the height of the cold war. We were already in awe, afraid and horrified of a mushroom cloud. Perhaps that's why much of the eighties (and early nineties) horror denigrated to the "gross-out". While the desensitized reader may not be able to be terrified of the work, there's always the gross-out. Whether as extreme depictions of violence, broken taboos and social mores, or out-and-out indecency. Schlock. As long as we live in some degree of safety, there is always sensationalism and schlock.